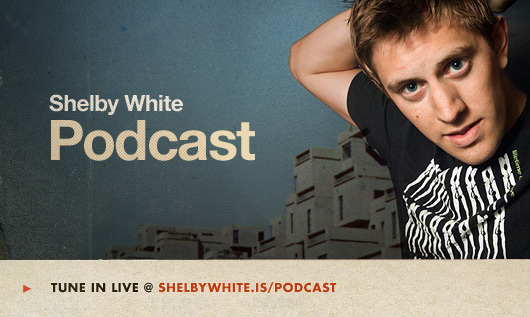 Podcast | Shelby White - The blog of artist, visual designer and entrepreneur Shelby White. A few months ago I started The Shelby White Podcast to talk with friends and people I look up to about design and life. Past guests have included James White / Signalnoise, Jeff Sheldon / Ugmonk, Jordan Butcher, Shaun Tinney, and Glenn Thomas—many more great folks to come. On Tuesday, January 8th @ 3PM the podcast returns with guests Alex Cornell and Jordan Butcher. This episode we’ll talk about that Facebook redesign floating around and redesigns done by people outside of the company. Future episodes of the podcast will range from design & technology to space & life. Also if you have any guest suggestions please let me know. I’m always excited to hear feedback. Update: Podcast episodes are now on iTunes.